The Fourth of July is a huge American holiday. It’s a day to celebrate independence with our friends and loved ones over a plate of delicious barbecue while watching fireworks from your boat or golf course. Unfortunately, with busy holidays come tragic accidents in many forms. This year, we’d like to help prevent that! The National Safety Council estimates that 466 people may be killed and an additional 53,600 may be seriously injured this year in motor vehicle crashes during the three-day Fourth of July holiday weekend. This is the highest predicted number of deaths the Council has released for the July 4th holiday since 2008. These deaths will be caused by driving under the influence, fatigue from long trips and distraction. Let’s change the odds; don’t let this happen to you. It’s not just accidents on the roadways that we are worried about this year. What about your annual family barbecue or hometown fireworks being set off near your four-legged friends? 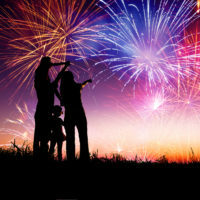 Of course, you must always obey your local laws regarding the use of fireworks, but there are a few major tips not everyone thinks about when handling fireworks on Independence Day, according to the National Council on Fireworks Safety. Wear safety glasses when shooting fireworks. Light one firework at a time and then quickly move away. Never relight a “dud” firework. Wait 20 minutes and then soak it in a bucket of water. Always have a bucket of water and charged water hose nearby. Dispose of spent fireworks by wetting them down and place in a metal trash can away from any building or combustible materials until the next day. Alcohol and fireworks do not mix. Save your alcohol for after the show. For the obvious reasons, never use fireworks around your pets. Not only will you avoid burns, but many fireworks are toxic to pets if ingested or even rubbed against. If you can help it, keep your pets inside at home; they may become frightened or disoriented by the sounds of July Fourth festivities. There have unfortunately been many occurrences of grills blowing up or igniting a bystander on fire. If you’re a homeowner and a friend is grilling and this occurs, you’re liable! Don’t let this happen. It’s important that someone always supervises a grill while it’s in use, and hopefully, it goes without being said that grilling should always be done outside, in an open area away from the house, trees, etc. When your coals have already been ignited, never add lighter fluid, and always use long-handled tools made for cooking on a grill. When the event gets social and your pets are around, you must be conscious to make sure matches and lighter fluid are far out of reach for your furry companions. According to the American Society for Prevention of Cruelty to Animals (ASPCA), ingesting matches or lighter fluid can lead to damaging blood cells, difficulty breathing, pneumonia, kidney disease, skin irritation, gastrointestinal irritation and central nervous system depression. Alcoholic Beverages: Did you know alcoholic beverages are not only bad for pets, but they can also act like poison is an animal’s body? Ingesting alcohol could cause a pet to become weak, lethargic and even go into a coma. In severe cases, death from respiratory failure has even occurred. Don’t let your energetic pup get into the punch bowl! Sunscreen: Many of us travel to the beach on this holiday and bring our dogs with us. They actually make special bug spray and sunscreen for dogs! Never apply sunscreen or insect repellent on pets that are supposed to be used on humans. Misuse can cause neurological problems in our pets, according to the ASPCA. All these tips can apply to daily life too. And you can even download a free Red Cross First Aid App to your phone with advice on everyday emergencies. Please stay safe this holiday weekend! Happy Independence Day!